Philosophy of Social Science provides a tightly argued yet accessible introduction to the philosophical foundations of the human sciences, including economics, anthropology, sociology, political science, psychology, history, and the disciplines emerging at the intersections of these subjects with biology. 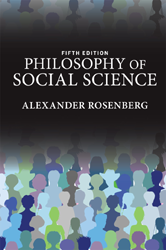 1 WHAT IS THE PHILOSOPHY OF SOCIAL SCIENCE? 11 SOCIOBIOLOGY OR THE STANDARD SOCIAL SCIENCE MODEL?